Our universal, powerful and environmentally friendly solution against dust. The patented nozzle head and the external nozzle ring generate a finely atomized water mist. 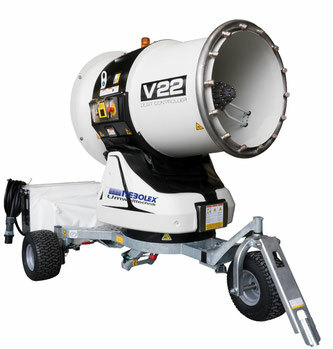 Typical uses for the V22 are: recycling plants, mining sites, quarries, material handling centres, sawmills, loading docks, demolition sites or waste disposals/landfills.